It’s been five years. When I started this blog back in 2006, I never thought just how far I’d take it. Heck, when I decided to travel five year ago, I never thought how far I’d go. The goal was simply to travel to Thailand on my own. I ended up going to Australia, Singapore, Malaysia, Indonesia, Vietnam, Cambodia, Laos, Brunei, Myanmar, Hong Kong and Macau. 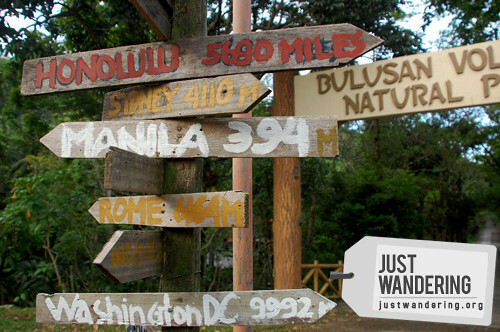 Just Wandering was created with the intent to be monetized — traveling doesn’t come cheap (it *can* be done in the cheap, but with the way I travel, I need lots of moolah). I needed all the help I can get. I’m not earning millions off the blog, even after 5 years, but it did a lot more than give me money. Just Wandering paved the way for several opportunities for me to travel: Mt. Daguldol with Columbia Sportswear; Boracay, Batanes, Coron and El Nido with Seair; Cagayan, Ilocos Norte, Benguet, La Union, Tarlac, Pangasinan, Zambales, Pampanga and Bulacan with Lakbay Norte of the North Philippines Visitors Bureau and the Manila North Tollways Corporation; Kuala Lumpur, Melaka and Cameron Highlands with Tourism Malaysia; Macau with the Macau Government Tourism Office, and; Hong Kong and HK Disneyland with Nuffnang. The five years that passed was more than just the traveling. It was about new experiences and new friends. I’ve meet a lot of characters in my travels and even just in Manila. They made life a lot more exciting, frustrating and all the more enjoyable. The past five years was also about growth and discovery. I’ve changed. Traveling is still something that I want to do, but I’ve also come to realize that there are other things I want to do. There are other goals that I want to achieve aside from traveling to Europe or Africa. It’s been a great journey. I’m looking forward to what the next five years will bring. Wow, Happy 5th Anniversary Just Wandering. Wishing you more adventures in the next 5 years. Happy 5th bday blog!!! Teh, hugs!!!! Kung anu man yang nararamdaman mo, ipagmuni muni mo yan!! At ikain natin yan!!! bawal daw ang hindi blogger! char! Each one of us starts the passion of traveling with the intent of doing just that, along the way we pick up a lot of things that spreads out our passions in life. In the end traveling becomes that gas that fuels other endeavors that allow us to avoid burnout in life. Yes it all starts with traveling. happy 5th. Happy 5th Anniversary Nina, I’m just a new reader and yet I felt I’m a fan from the start. Thanks for sharing your travel experiences to us. Cheers! Happy anniversary nina! keep the stories coming! happy 5th Nina. it is such an honor to meet you and have travelled with you. wish we can see each other again soon. keep it up. Thanks G! I miss you! Dapat matuloy na talaga ang Little Tokyo natin! Ikaw rin kaya matagal na rin! Salamat Estan! Happy Cinco Anniversary! Dapat Europe na ang kasunod! Onga, dapat Europe na ang sunod! Salamat Mica! Happy 5th! Keep it up Nina. Remember this life is NOT a dress rehearsal , so make the most of this opportunity. Happy blogversary, justwandering.org! More power! Wow! 5 years is long in blogging years Nina! Congratulations! …and that’s just my travel blog Thanks Lois! Happy 5th – and that’s counting! Here’s to seeing you on more backpacking adventures – be it in India, Morocco or Peru (my faves)! I can’t wait to explore those places too! Thanks Mr. Ultimate Nomadic Pinoy! Happy 5th anniversary Just Wondering & Nina!! I wish for more of your travels & wonderful things happening! Hahahaha, walang pa-contest, poorita ako ngayon! So excited to see you again! Congrats Nina! You’ve done such a great job with your blog and I am sure it will enjoy more success. thank you Nina for paving the way for other bloggers! You’re such an inspiration! Nye! Ang haba ng hair ko hahaha. Thanks! Wo hao! Enjoy China Flip! Congrats Just Wandering Nina. More travels to come! congratulation on your 5th anniversary. here’s to more travel destinations and ton more of postings. Just greeting your blog happy fifth. Your blog inspired me to start my own blog, and up until now, I’m still a big fan of yours. Here’s to more travels. Cheers! Sana marami pa kayong mapuntahan para marami rin kaming mabasa pa.. Happy 5th year anniversary JustWandering! We wish you more beautiful moments and great fun! Happy 5th Blogaversary, kainggit ka naman po, buti ka pa kung san san na nakapunta hehe. I admire your experience as a blogger kase you travel and share your adventures to everyone and it is nice. God Bless you and your blog. Congratulations to one of my favorite travel bloggers! More power (and more travels! ), Nina! happy anniversary nina! parang magjowa lang hehe… congratz! WOw! COngratulations, Nina! Great job! This is kinda late but congratulations! Keep on traveling and writing about it. I learn a lot from you. God bless! I’ve been wanting to start my own travel blog but only found the means this year. Your travel stories definitely pushed me to start writing as well. Happy anniversary to your blog! Cheers to more travel stories! Thanks! Enjoy your trip to Melaka, I hope it doesn’t disappoint! Nina my Australian Visa was refuse… so sad. may chance pa ba na mag apply ulit I booked my ticket on Dec 19. sabi ng agent ko apply daw kame ulit.